that's why it took us a while to post some news here :-). 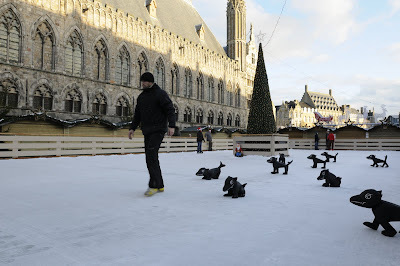 For Woestijnvis, we shot the Winter-version of the 'Man bijt Hond'-leader in Ypres. This version will be screened until the Spring-version we will shoot in March. For our Beast Wishes we created a youtube game with a new character called 'Bazas'. 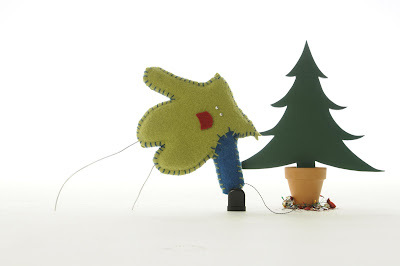 Every single aspect of this project was done in-house: puppet-building, animation, postproduction image and music. We are planning more funny stuff with him in 2010. For Strass Interactive, we build a prototype of a puppet they wanted to use in an online campaign. For director Douglas Boswell we are building an animation puppet called 'Slensje'. It's a test for one of his upcoming projects. For our 'Master Bator' project, we made a (slightly animated) Season's Greetings card, which can be seen here.